Horseradish Garlic Condiment - 2 tbsp. coarse sea salt - 1 tsp. small, tender greens - 2 c.
Fill a medium saucepan with water and bring to a boil over high heat. Add the beets and boil until a paring knife easily slips into the largest one, 30-40 minutes. Use a slotted spoon to transfer the beets to a paper towel to cool. Once cooled, peel the beets, discarding the skin, and slice the beets into wedges (wear gloves to protect your hands from staining). While the beets cook, make the dates and the cider sauce: In a small saucepan set over high heat, add the apple cider and bring to a boil. Reduce the heat to medium-low and simmer until the cider becomes a glaze, about 15 minutes. Add the dates and cook for 30 seconds to warm the dates through. To a clean medium saucepan, add the butter and melt over medium-high heat. Add the date-cider mixture, and then add the beets, cooking until the beets are heated through, about 3 minutes. Stir in the Horseradish Garlic Condiment, lemon juice and salt and stir to combine. 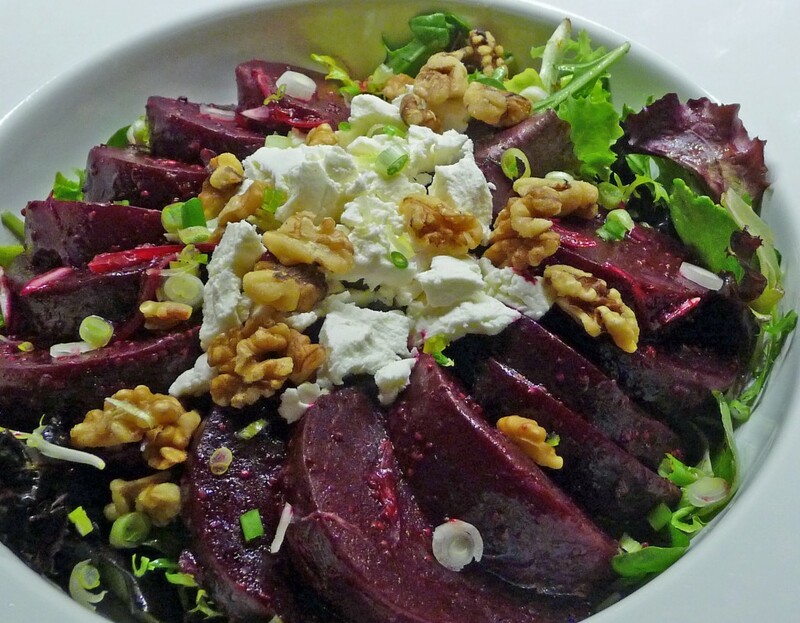 Divide the greens among 4 plates and top with some of the beets and sauce. Serve warm. 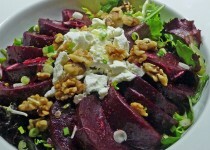 NOTE: Beet tops, cleaned and steamed can also be used in place of the tender greens.